“I don’t like this government, and I cannot trust it. You must change it and offer guarantees of the observance of what you promise me…If you don’t want me as a friend, you will find out what it is like to have me as an enemy”. It was a threat, and not a very thinly veiled one, that gave the Florentine government just four days to make their decision. And it was a threat that the Florentine’s didn’t take seriously. During those meetings, Machiavelli and Soderini discussed other things with Borgia. One of these discussions ended up with an agreement made that Leonardo Da Vinci would come and work for Borgia. Once the meetings were finished, and aware of the time limit that Cesare had given, Machiavelli himself rode as fast as he could back to Florence so he could discuss with the Signoria what had happened. Official letter written by Machiavelli in November 1502 from Imola to Florence. It would end up with Borgia being used as a model for Machiavelli’s “Il Principe” in which he described the best types of leaders. He had watched as Cesare had ruled his states in the Romagna with a heavy, yet fair hand. He watched as Cesare punished those who went against him, including having one of his men executed and his body parts left outside to rot. And he watched as the man tamed the Romagna into peace. 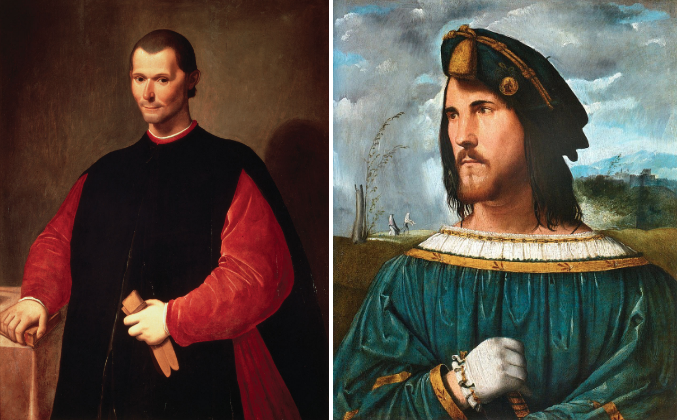 Borgia’s methods, his charm, his intellect and his ‘no nonsense’ attitude certainly struck a chord with Machiavelli, so that even after Borgia’s death in 1507 Machiavelli would still respect the man who had made demands of him on that fateful night in Urbino.